Illinois keyed latch. Mechanical. Fits 7/8" hole. 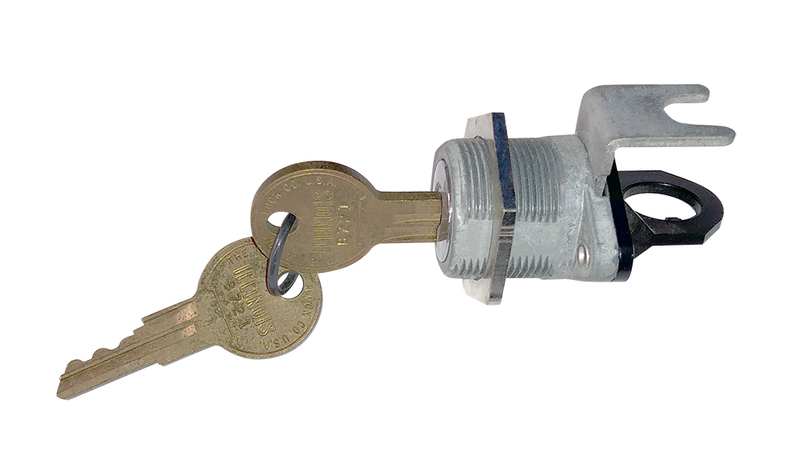 Key removable in 1 position only. Includes 2 keys. 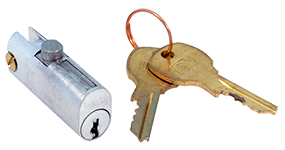 National Lock 5 disc tumbler cam lock. 90º turn - key removable in locked and unlocked position. For metal or wood applications. All keys: C415A. 5/8" cylinder length. Fits 3/4" hole. Comes with straight and formed cam. Edwards Co. / General Signal mortise type door opener. Solid brass faceplate and nosing, NOT brass colored paint like newer model. New vintage stock. Made in the USA. Screw terminals. 12 - 16v AC or 4.5 - 6v DC. 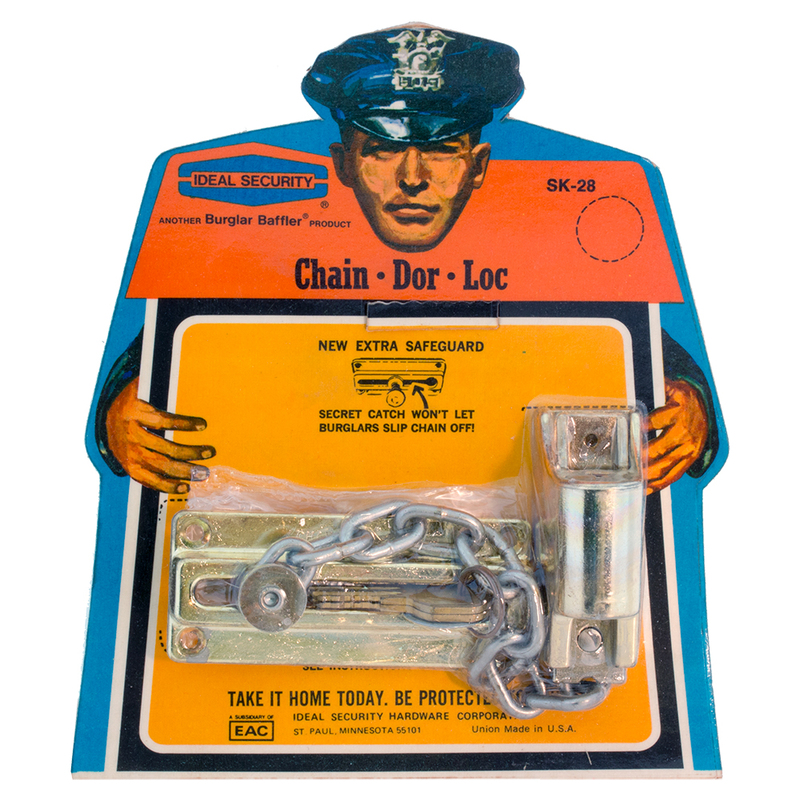 Ideal Security Chain-Dor-Loc. 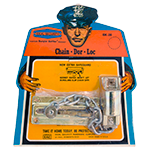 Key operated safety chain. Includes 2 keys. 10 per carton. Blister pak for peg hook. Union made in the USA. A.L. 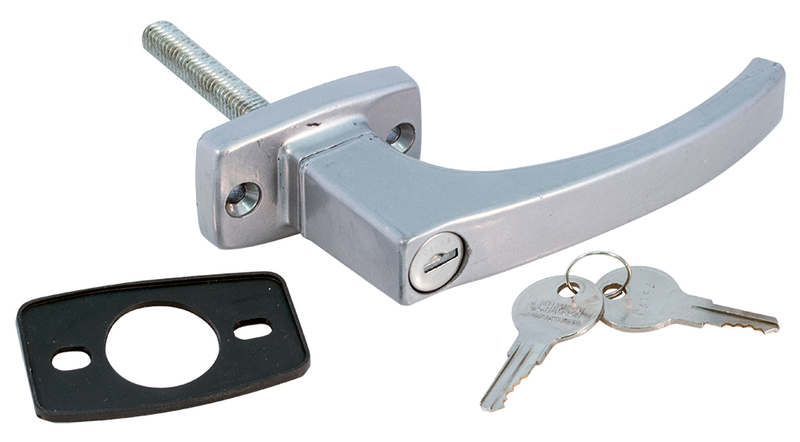 Hansen Manufacturing locking handle. Includes mounting gasket (plastic). 2-1/4" threaded shaft, 2-1/2" total depth behind mounting plate. 2-3/16" diameter mounting holes. Handle length: 4-3/4". Weighs 13 oz. Includes two keys. New in package. National file cabinet lock. 1-3/4" long. 4 pin tumbler. Includes 2 keys. Available in Key #107 only. Key removable in locked position only. Never cheaper. Replace all locks so cabinets are keyed the same. Anchor Lion nickel chrome clasp. Presses into cardboard or light wood. 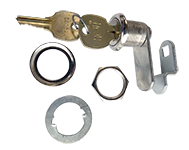 Set includes backer, hasp and clasp. 1.37" x 0.96". 10 dozen pieces per box. 132 boxes available. Southco panel latch wire cam. 1.944" c-c flange mount holes. (1). Drill 0.6" hole indoor. (2). Mount latch from back side. (3). Snap knob into place. Harris P/N: 448-0664-00. 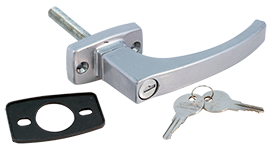 Positive locking draw latch. Recessed flush mount. Nickel plated steel. 1"W x 1-3/8"L x 5/8" deep. Flanges 2-1/4" x 1". 1-13/16" c-c mounting holes. 1-7/8" closed, 2-1/16" open. Keyed industrial latch. 2 point cam lever. Galvanized steel. Folding "D" ring handle. Flush mount. 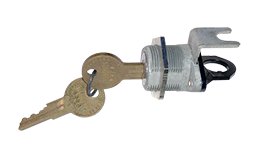 Key can be removed in locked and unlocked postion. Weld flange or drill and bolt to secure. 4-7/8" outside diameter. 3-3/4"D inset, 4"D hole required. Cam is 4" end to center. Illinois Lock Co. cabinet lock. Key removable when locked. 2 keys. Nut not included. 0.75" hole required. Southco captive screw. DZUS lion quarter turn. 0.745"L stud. 0.562"D slotted head. Nielsen draw latch. 9/16" c-c mount holes. 1-1/8" overall width. 2-3/8" overall length. 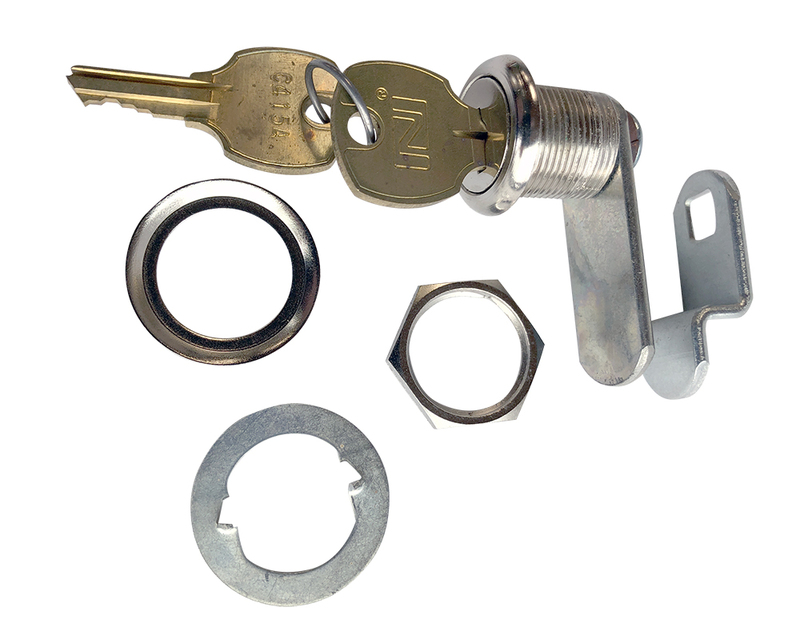 IBM cabinet lock cylinder with arm, mounting clip. Includes two keys. 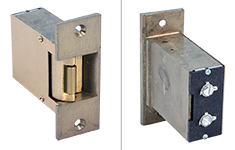 1" or 1-1/4" CL latch. 0.589" diameter bezel. Requires 0.46" diameter hole, 3/4" behind panel depth. Cabinet latch. Solid bronze. Keeper plate requires pilot hole in front panel. Arm: 1.5" EC. Knob: 1.5" wide. 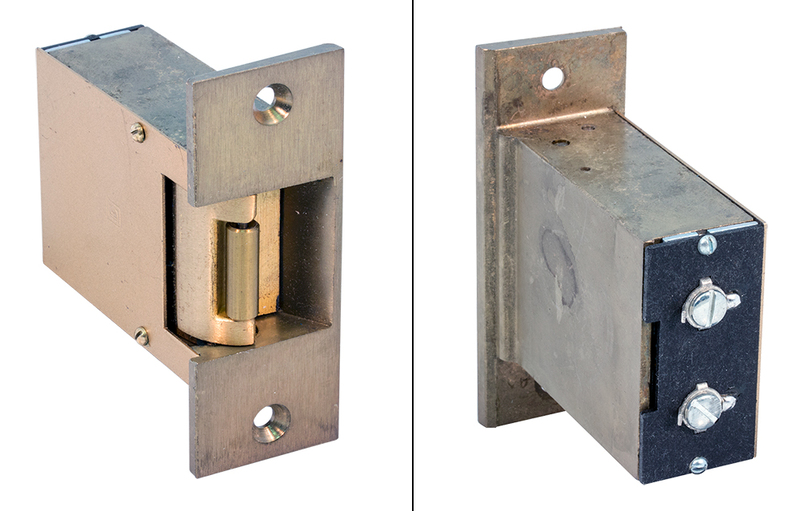 Steel latch / catch. 1-3/8" x 2-1/4" x 5/16" lip. 1" c-c mounting holes. Fits the following C-L load rated hooks: S4055A, S4055B, S4055C, instructions included. 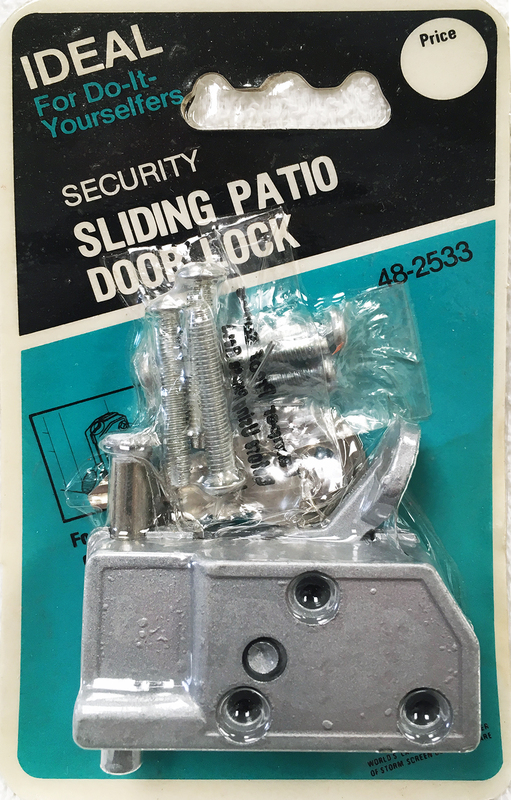 Ideal Security Hardware Co. sliding patio door lock with key. Installation hardware included. 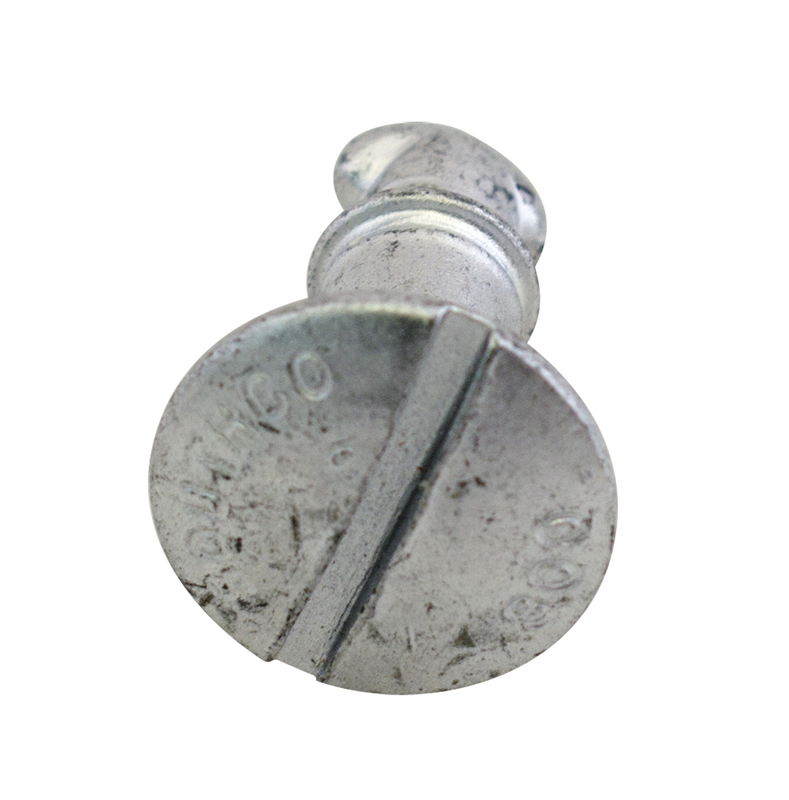 A heavy duty plated steel cabinet latch made for locking rack doors or ?? 3" x 3-5/8" opening required for mounting. 33-1/4" maximum extended arm length. 3 keys included. Made for US Military. 9/16" diameter x 15/16" projection. Mounting 1-3/4" long x 7/8" wide. Holds doors and covers shut without precise alignment. Right hand locking, slotted for screwdriver operation. Cylinder size 9/16". Overall length 1-5/8". Flated shaft for knob or handle. 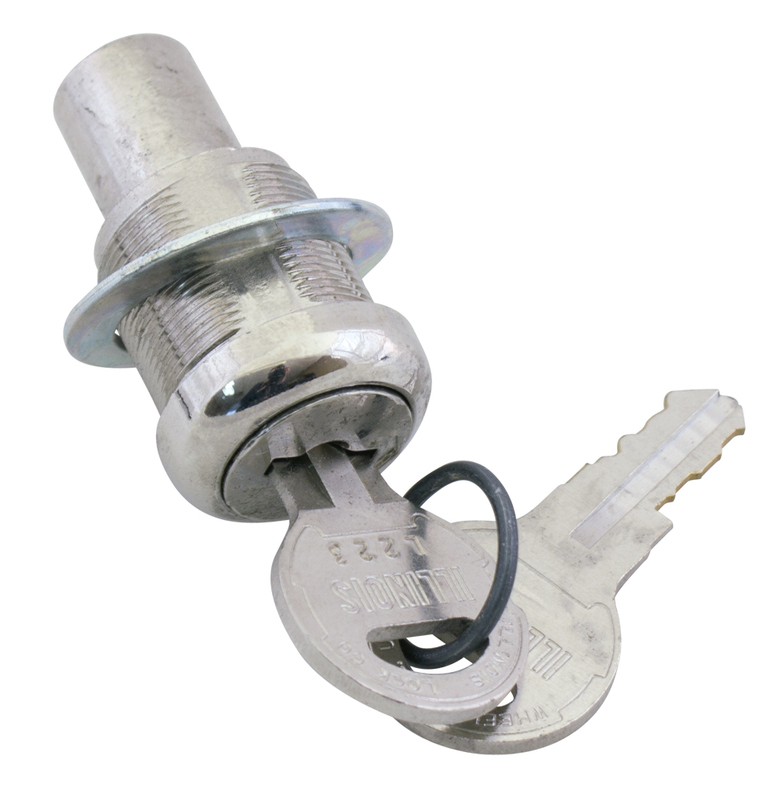 Turn 1/4 turn to lock or unlock, turn further if you wish to increase locking tension. 1/2" mounting hole. 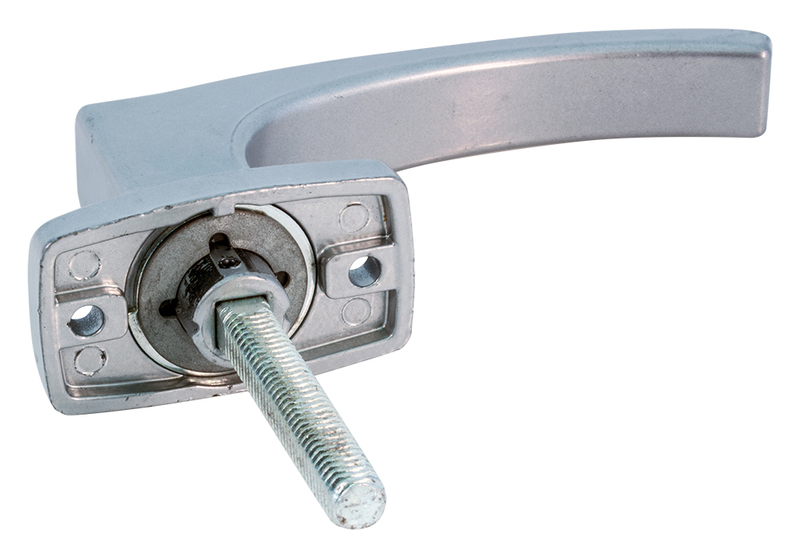 Lever latch. 1-3/4" overall closed, 2" overall open. 180º lever swivel, 90º pivot on bracket. 1/4" travel. 15/16" x 15/16" mounting plat. 2-7/8" long lever. Concealed draw latch. 5/16" hex drive. 5/8" diameter jaw rotates 90º to nest concealed. Continued pressure when engaging causes a cam action to cinch tight, reverse pressure releases. 2-3/4" c-c mounting holes. Measures 3-3/4"L x 1-3/4"H x 11/16"W.
1-7/8" wide, 2-1/8" overall length open. Same as above except 2" overall length open. Same as left except, 1-7/8" wide, 1-11/16" overall length open. 5/8" wide, 5/8" deep. Metal catch for spring loaded latches. Screw mount. 1-3/16" wide flange, 3/4" deep x 5/16" high. Screw mount holes 7/8" centers. Mount this catch on parallel surface like the lid. 1-9/16" wide, 1-1/4" height. 1/2" rod or bar diameter. Spring loaded, locks into place. 1-3/16" x 3", shaft length 1". 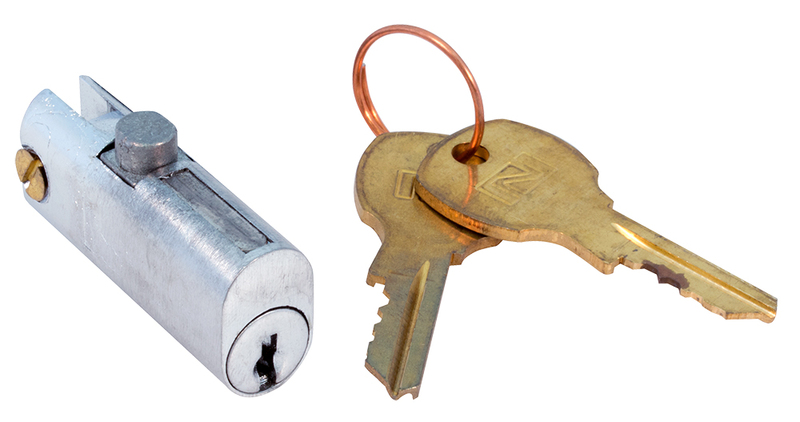 Slide the barrel into the groove and snap the bolt action lock down for immovable security. Solid brass.